Nearly everything important in twelve-year-old Gabriella's life that summer of 1957 can be traced to the river. On the North Carolina military base where she lives, she meets the African-American Marine Hawkins by the river's brown-green water. 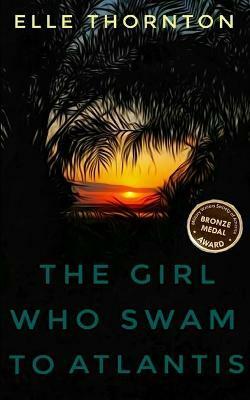 Hawkins, a servant in the kitchen of her father's quarters, becomes her swim coach and a person she can talk with--even about the tragedy of the youth Emmett Till: despite brutal beatings, Emmett Till refused to say what his racist murderers wanted--that he wasn't as good as them. In The Girl Who Swam to Atlantis, Emmett comes to life in Gabriella's heart while Hawkins teaches her to swim. At the river Hawkins helps her find her strength. Emmett helps her find her heart. Emmett had been murdered for whistling at a white woman. Could her friendship with Hawkins endanger the tough Marine? It doesn't seem possible. Until a sudden storm on the river changes Gabriella's life-forever. My background as the daughter of a career Marine and my professional experience as a newspaper reporter and technical writer helped prepare me to write The Girl Who Swam to Atlantis. In working on the book, I've learned that few works of fiction exist in the middle-grade/young adult category about military families or military history. I only knew Emmett Till's name from the Bob Dylan song, "Ballad of Emmett Till," until one of my African-American students mentioned the name to me: Something in my student's eyes and voice told me I needed to find out about Emmett. I am very grateful to say that I did. Since then I've learned that adults and young people of different racial backgrounds, even African-Americans, do not know the name or story of Emmett Till. Ultimately, while my background prepared me to actually write the story, nothing prepared me for the emotional impact of writing about Emmett Till. During the writing, he's become part of me: as I see it, this is the true gift from having written The Girl Who Swam to Atlantis.